A mother-to-be who eats fish during the later stages of pregnancy is less likely to have a very small baby, research suggests. However, the University of Bristol team found no evidence a fish rich diet extends the length of pregnancy. Low birth weight is associated with an increased risk of health problems such as heart disease and diabetes. The research, based on almost 12,000 women, is published in the Journal of Epidemiology and Community Health. This work adds to the evidence that fish is an important part of the human diet. The researchers asked the women to record their fish consumption at 32 weeks of pregnancy. From this, they calculated their intake of omega-3 fatty acids from fish. It is thought that these fatty acids have a beneficial effect on health. On average, the women ate the equivalent of a third of a small can of tuna each day - equating to 0.15g of omega-3 fatty acids. However, a diet rich in fish seemed to boost the foetal growth rate in pregnancy. The more fish the women ate, the lower were the rates of restricted foetal growth. Although this association was not as strong when other influential factors - such as smoking - were taken into consideration, it was still significant. Restricted foetal growth normally occurs in one in 10 pregnancies, but in women who ate no fish this increased to around one in eight (13%). Lead researcher Dr Imogen Rogers said: "Being very small for dates at birth has been associated with increased risk of high blood pressure and other problems in late or middle age. "This work adds to the evidence that fish is an important part of the human diet and reinforces the recommendation that pregnant women should include at least two servings of fish a week. "Including oily fish is a good habit to encourage." Dr Roberts said it was possible that omega-3 fatty acids helped to boost growth rates by making the blood less sticky and increasing its flow through the placenta, thus upping the amount of nutrition a baby receives from its mother. The researchers point out that trials of fish oil supplements suggest that they lengthen pregnancy but do not boost foetal growth rate - the opposite of their research. But supplements tend to contain higher levels of omega-3 fatty acids than would be found in the normal diet. 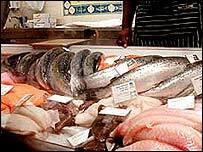 The Food Standards Agency advises pregnant women and prospective mothers to avoid eating shark, marlin and swordfish because they contain relatively higher levels of mercury. They may also need to limit the amount of tuna they eat. Fiona Ford, a research dietician at the Pregnancy and Nutrition Centre at the Royal Hallamshire Hospital, Sheffield, told BBC News Online that there were concerns about just what effect pollutants were having on oily fish. "My advice to pregnant women would be to eat a lot of flax seed, which also contains omega-3 fatty acids, and to eat oily fish once or twice a week," she said. The centre runs a helpline on 0845 1303646.